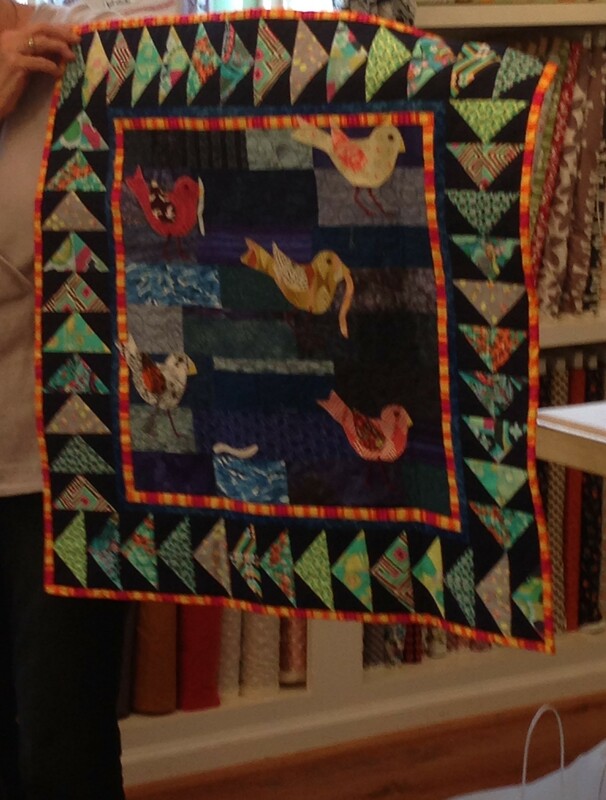 Here are some of the beautiful quilts from our Fat Stacks meeting last Wednesday! 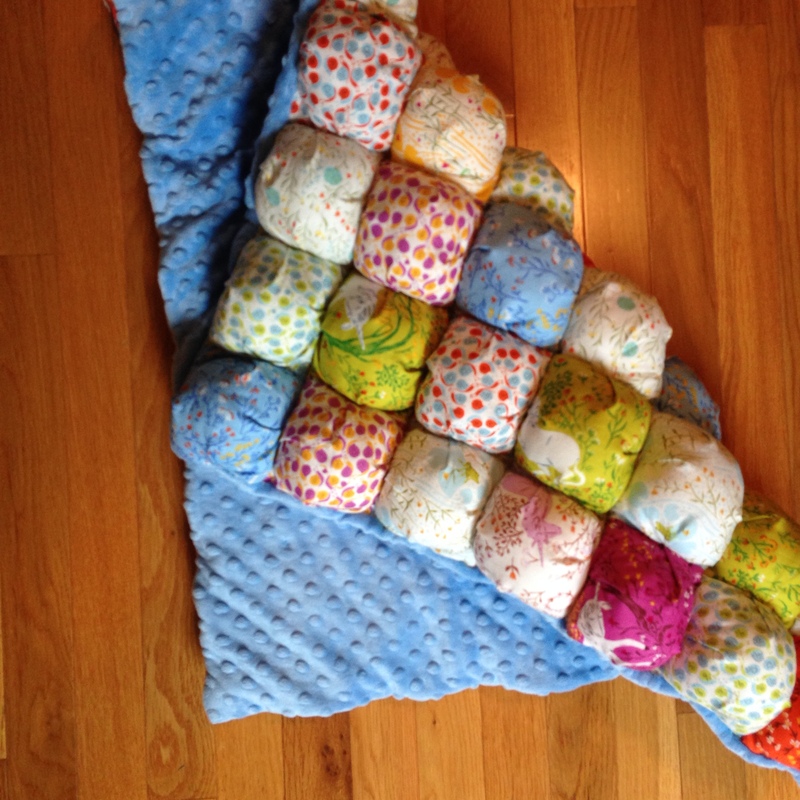 We started with Gina’s wonky log cabin baby quilt. Gina is going to have a little girl in April. Yay!! 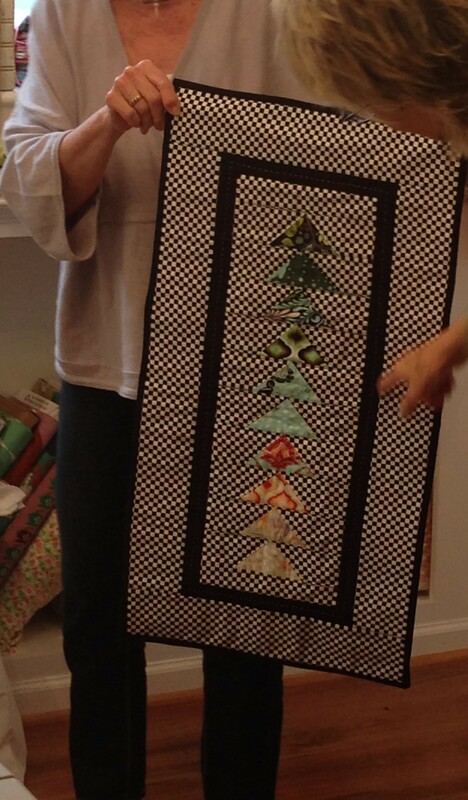 Jennifer’s Girl Scout quilt. Sorry for the blurry image. We were excited! 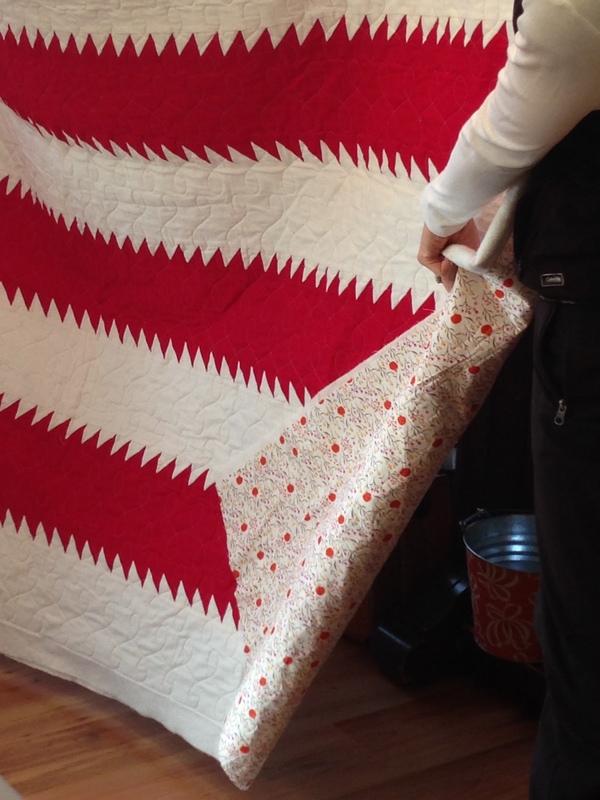 Ellen’s sawtooth quilt from Denyse Schmidt. 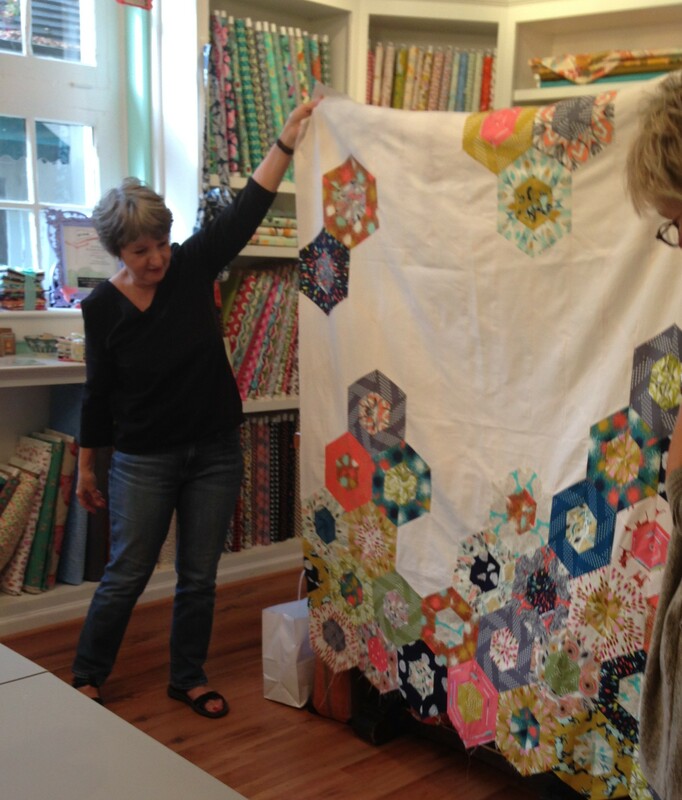 This quilt is now officially on my bucket list. The back makes it even better! Sue’s Feathers from Allison Glass. We loved her background. 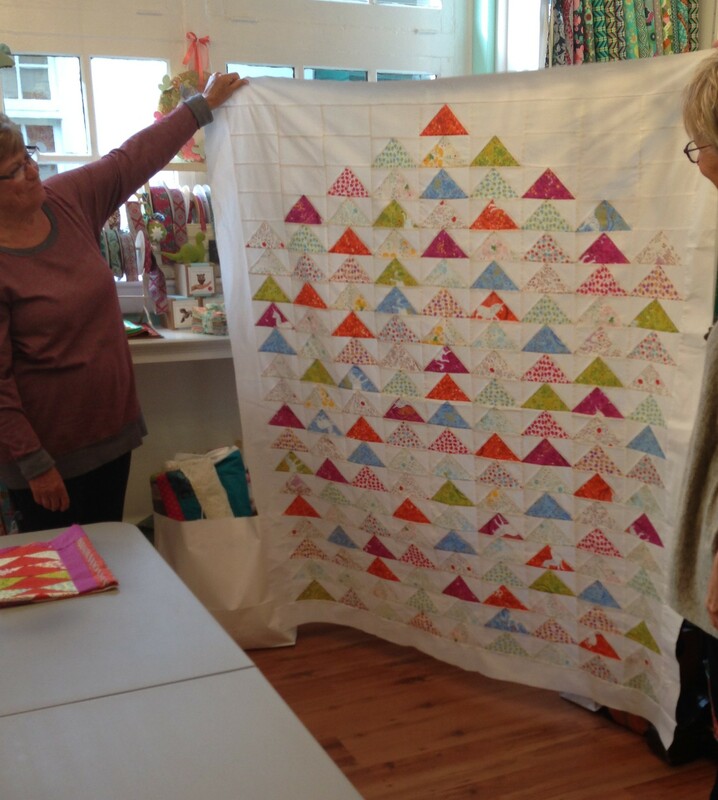 Kay’s original design flying geese! We had a flying geese challenge this month. Kay’s Windmills. We loved her block centers. Carole’s flying geese. 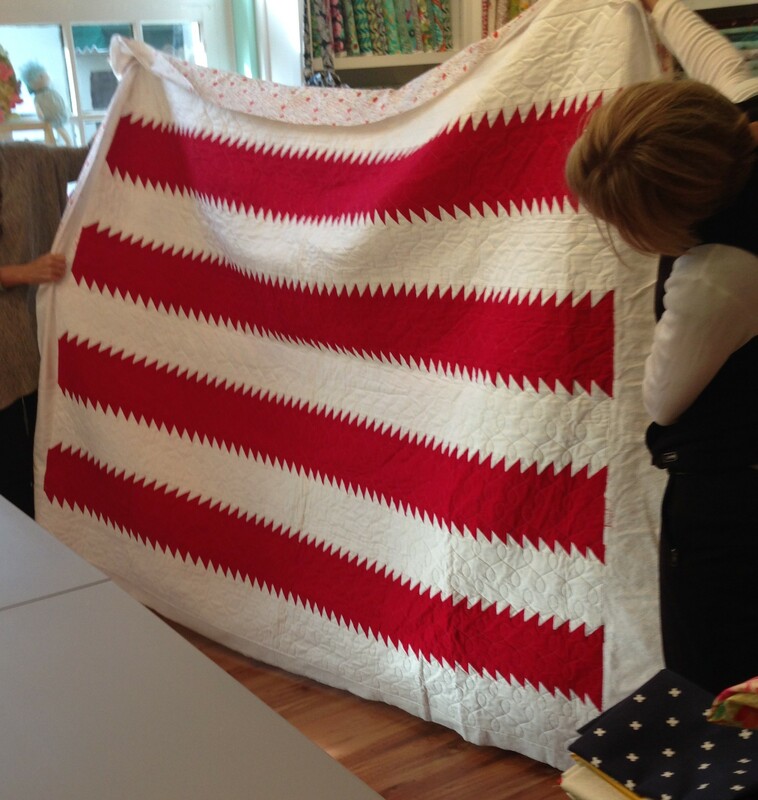 There’s some big stitch hand quilting happening here too. Diana’s Science Fair. She used Cotton + Steel and we loved the swirls! Tillie’s Science Fair. It’s wonderful Tillie; your color choices are so great! I teach Science Fair as a precision piecing class. There’s a new class on the schedule; come join us. Beverly’s Science Fair. 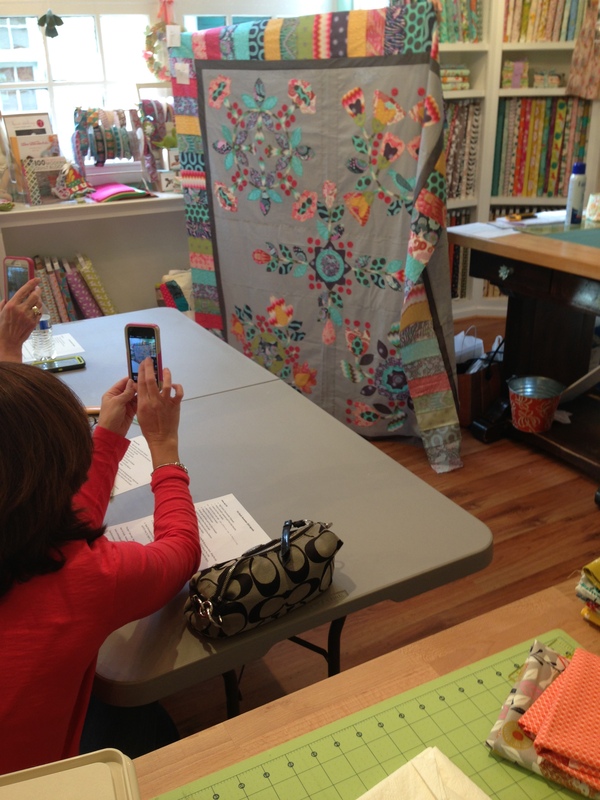 Beverly wasn’t able to be with us but we took a picture of her quilt!! Ginny’s Science Fair. Ginny couldn’t be there either but that didn’t stop us from showing her beautiful top. Ginny used Essex flax for her background. 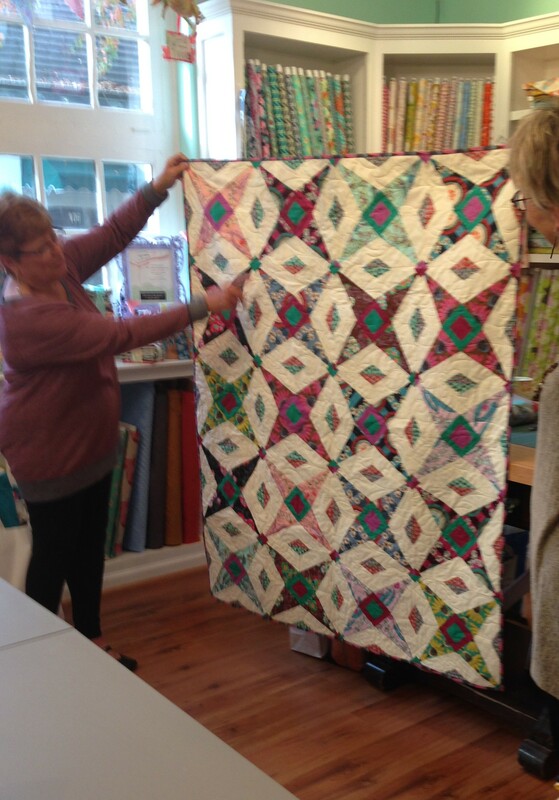 Joan’s Treelicious quilt. Did I mention that I taught her how to applique?? 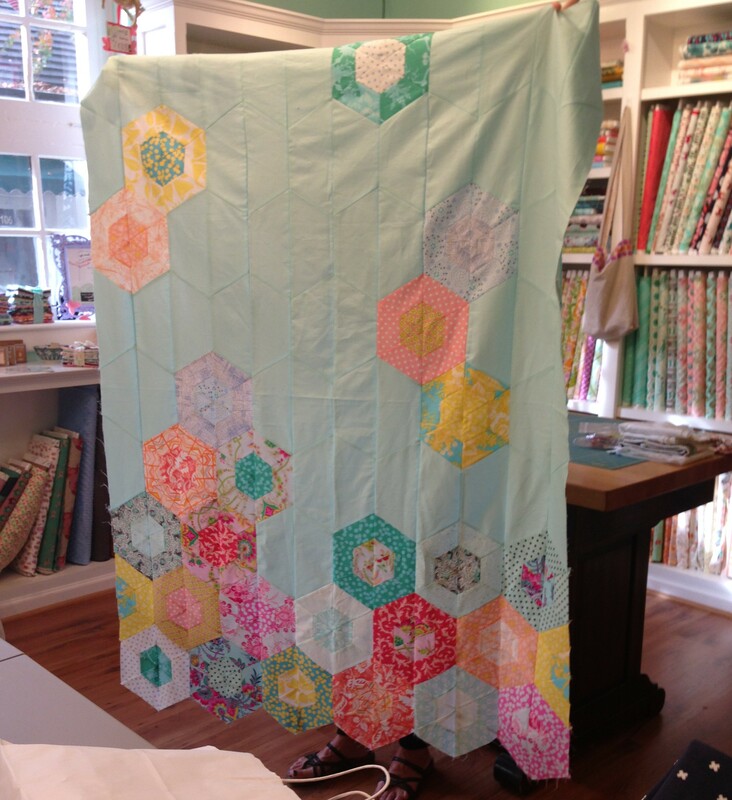 Here’s my Serendipity Sampler…almost finished. 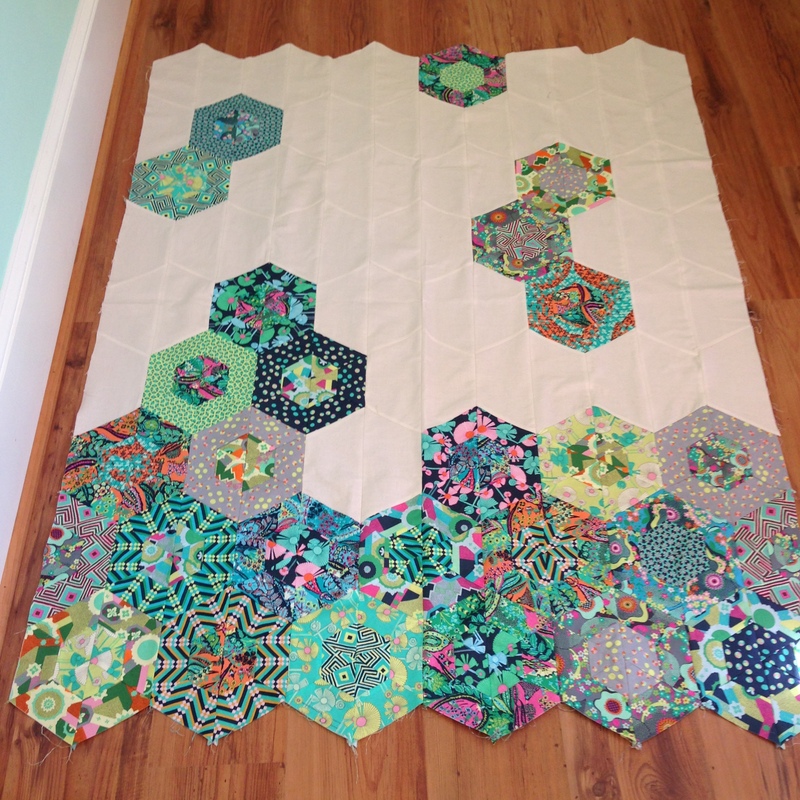 My classes are starting to finish their tops; look for them on the blog. I’m starting a new class on the second Monday in January. 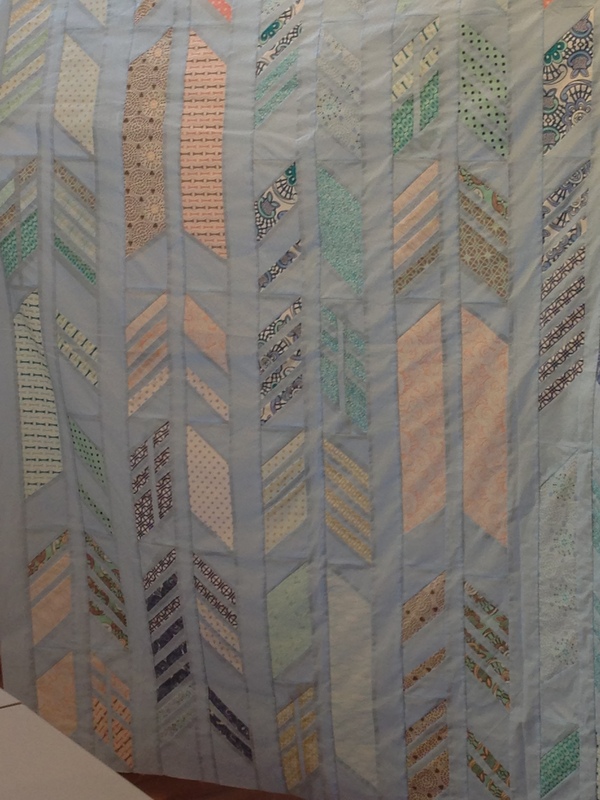 This is a great beginner hand applique block of the month. Contact me if you are interested. 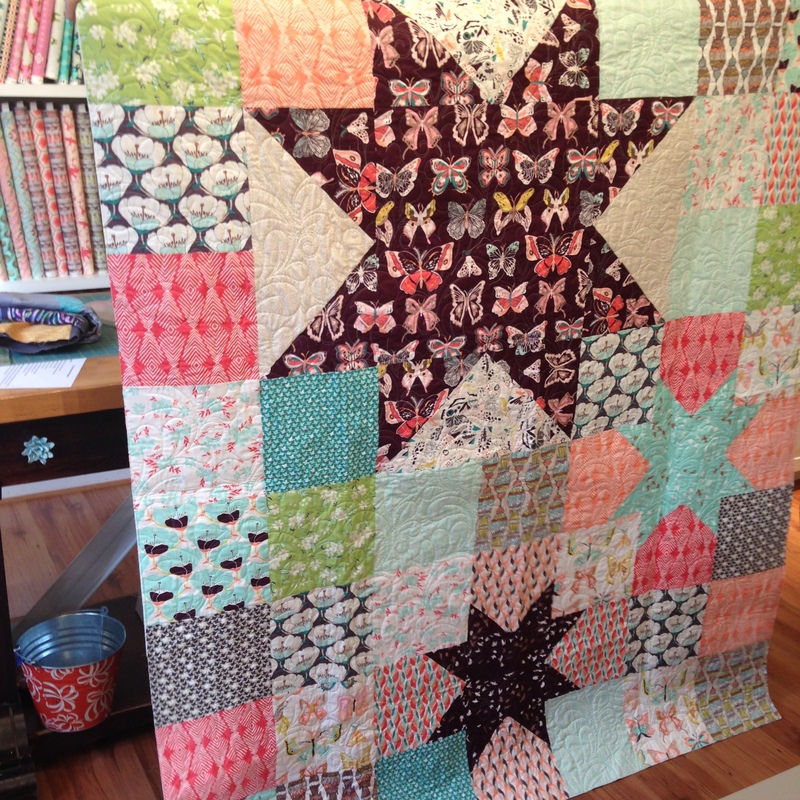 What would a bubble quilt be without Minkie from The Little General on the back?? We had a lot of fun with this. 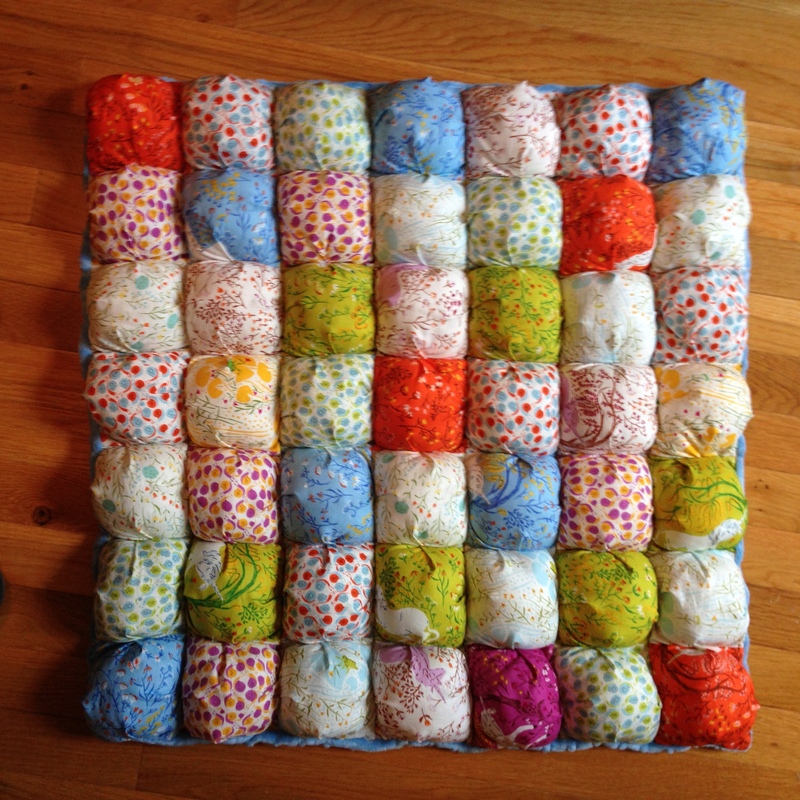 If you want to make one…and I know you do…Awaiting Ada has a really good tutorial on her blog. We had a really fun morning. If you are interested in joining this talented group just contact Gina at The Little General. She will take good care of you! Finally, The Little General is having an Open Sew at The Barn in Reynolda Village on Monday, November 17 from 9:00 until 3:00. The cost is $25. 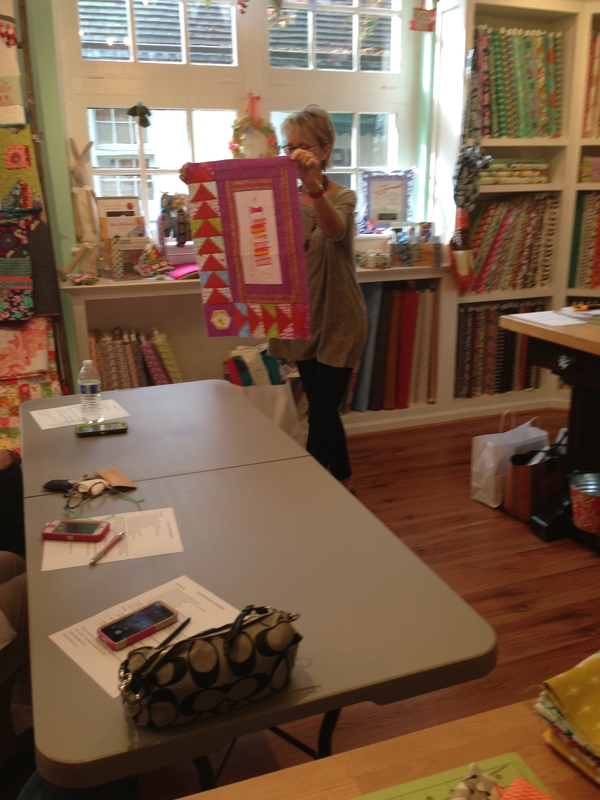 Bring a project and come sew with us! Gina Allen and I will be doing one of our whiz-bang tutorials about 10:30 so it should be a big time. The Barn is a great space with lots of room and we are excited! Hope you have a great weekend and thanks for reading my blog! This entry was posted in Uncategorized and tagged Fat Stacks on November 8, 2014 by kathleenbaden. Fabulous as usual. I love this group. So inspiring and creative!! Congratulations all. Science Fair and Serendipity definitely on my bucket list. Would love to be able to take your classes. 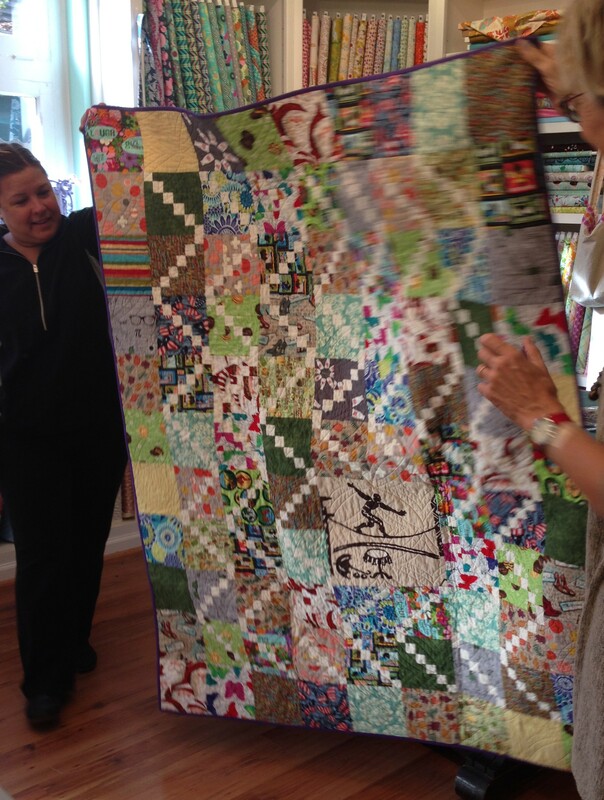 Such a talented group of quilters. 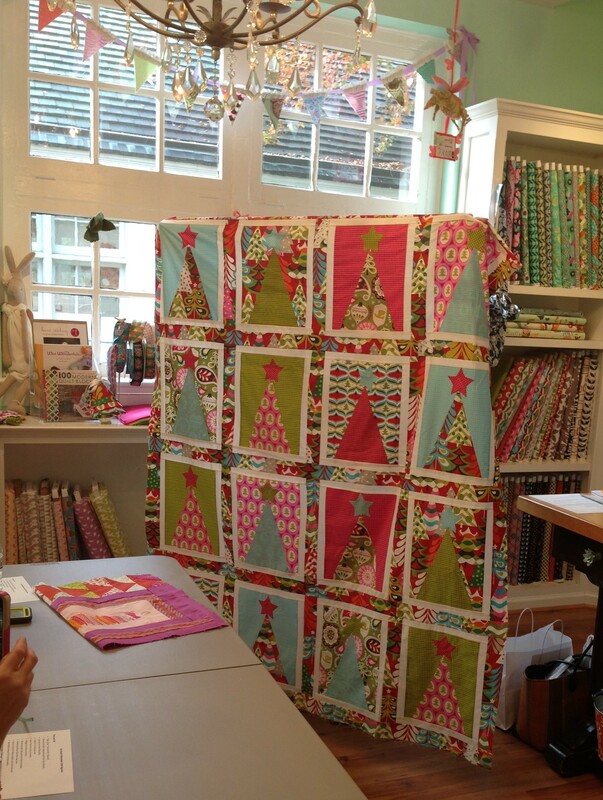 Love all the fabrics especially the Tula. Great job!!!!!! Thanks Linda! I love Tula too!